Happy Friday! And... Happy Birthday to my sweet Averie Ann! Today, my baby turns 7! She is so excited to have a couple friends over at the cabin and a little party on Saturday at the lake. I can hardly believe seven years have passed. Someone make it slow down! While at CHA, I ran into my sweet friends Meridith and Tricia from Lizzie Anne Designs. Those two girls are the sweetest! I miss being on their design team! Have you seen their new sets? 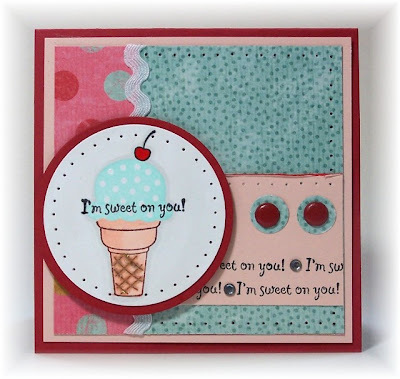 I LOVE LOVE LOVE this one called Sweets and Treats! All the parts interchange... totally clever! The inside says " Wishing you a sweet birthday". Such a fun summer set... thanks girls! Paper: My Mind's Eye, Riding Hood Red, Blush (Stampin'Up!). Ink: Coffee Bean Brilliance, Glacier Ice Colorbox, Ranger Soot Black, Copic Markers. Other: Brown Sugar Sparkly Fluff, Quickie Glue Pen, American Craft Brads, Circle Punch (SU! ), Rhinestones, Circle Nesties, Wizard, Clear Sakura Glaze pen, Crafter's Tool Kit, Jody's Foam Dots, Zip Dry, Scor-Pal. Check out the weekend sketch girls! 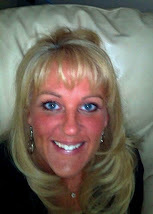 Beate is back, so check out her blog for the sketch. Thanks Beate! Happy to have you back girlfriend! This is just adorable, adorable! Happy birthday, A! May you have many, many more! and p.s. totally agree about time needing to slow down! This is an adorable card Cami! SO sweet! SWEET! I miss you on LAD too! 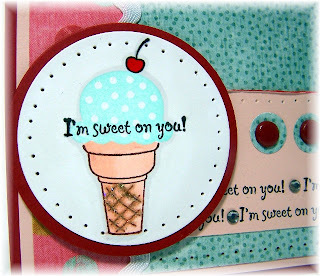 Super cute card, Cami -- great ice cream cone! Happy birthday to A! Yummy card!! Happy Birthday to Averie. My son will be 7 next month! Aaack! How cute is this!!?! I adore that ice cream cone...and that cherry on top! Couldn't be sweeter! A HUGE happy birthday to your daughter!! Woohoooo!! Happy birthday wishes to Averie! Who wouldn't love to receive this amazing card? It's so adorable. What an adorable card! I love it sweet friend! Happy birthday to your little girl. Happy Birthday A!!! Hope you had a BLAST this weekend!!!!! LOVE that card! aahhh, I LOVE THIS,,,having 3 granddaughters and tons of nieces, this would be the PERFECT card for their cute BD's. also know some grown-ups who would love it too.. Thanks for Perking me Up!